This lower section of the Clavey River is reported to be more difficult than the upper section, but very beautiful and pristine. Put in: The road to the put in bridge is reported to be very long and hard to find. Additionally, in the early season it appears common to have fallen trees across the road. Many boaters simply paddle the upper section first, camp at the lower bridge or just paddle both upper and lower sections in one long day. Take out: The Clavey River joins the wild and scenic Tuolumne at Clavey Falls. Boaters must continue downstream on the Tuolumne River to take out at Ward's Ferry Road. Camping options are reported to be very limited along the lower Clavey. This is the approximate location of the USGS streamgauge that was operational from 1959 to 1995. Optimum flows for both upper and lower sections are reported to be around 500 to 900 cfs at the upper put in. Three miles downstream, Reed Creek will add another 150 to 300 cfs. So optimum flows at the lower run should be around 750 to 1200 cfs. There are no functioning gauges on the Clavey at present so there is no way to know for sure what the flows are without going and looking at the River. Once at the river there is no way to know exactly what cfs you are looking at either, so use good judgement about whether the river seems high or low. Dreamflows estimates flow during late spring and summer based on historical relationships between Clavey and other nearby gauges. 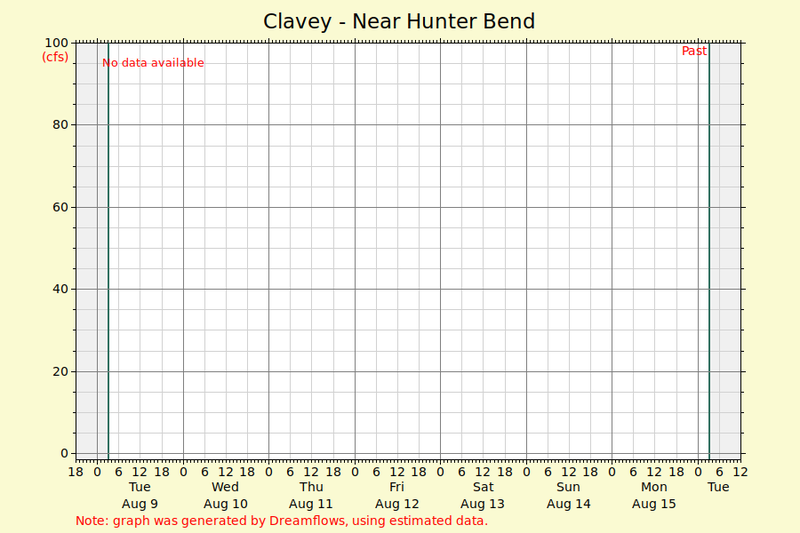 There were two historical gauges on the Clavey River, plus a gauge on Reed Creek. This gauge was operational from 1959 to 1995 and was located close to the put in at the lower bridge at an elevation of 2,374.08 feet above sea level. If there is still a staff gauge visible on the river you can estimate the flow in cfs from the historical readings. Some flows in cfs compared to gauge height. The Peak Streamflow page also shows both gauge heights and cfs. That data is copied below.